This page contains conference details and proceedings including educational materials and podcasts of the MISWeek, The#1 MIS Meeting, Minimally Invasive Surgery Week and SLS Annual Meeting. 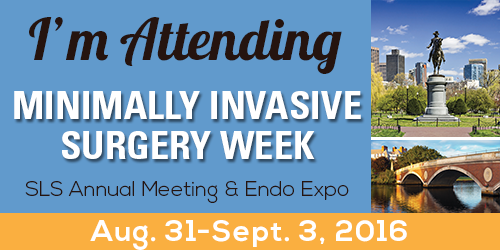 An Event in Late August-Early September, this multispecialty conference of a number of MIS Societies, helps increase knowledge of laparoscopic, endoscopic, and minimally invasive surgical techniques. The Meeting consists of hands on Master Classes; Plenary Sessions; Special Interests Groups (SIG) Committee Updates of multiple topics; Expert review and discussion of surgical videos showing accidents, mishaps, and surprises; Deconstruction of video-taped surgeries performed by master surgeons; Exhibitions; Competitions for Best Papers, Videos, and Posters from Professors to Fellows and Residents; Future Technology Sessions; and over 200 General Surgery, Gynecology, Urology, and Multispecialty Scientific Presentations. An idyllic urban retreat for travelers, The Westin Coley Place is set in the center of one of historic Boston’s finest neighborhoods, Back Bay. the hotel features Westin’s exclusive 10-layer Heavenly Bed, the WestinWORKOUT Powered by Reebok Gym with indoor pool, shopping in the retail gallery at Copley Place, skywalk access to more than 100 shops at Copley Place and the Prudential Center as well as the Grettacole Spa, located adjacent to the hotel lobby. these rates are subject to appropriate state, local, and occupancy taxes and do not include meals. This rate is now being offered on a space-available basis. Check reservation website for applicable dates. In order to qualify for the special rate, you must mention that you are attending the “SLS Conference”. Deadline for SLS discounted rates is July 31, 2016. For negotiated airline discount rates contact Steve at The Store For Travel, toll free at 1.800.284.2538. Outside the United States call 305.251.6331. E-mail: steve@thestorefortravel.com. Please be sure to mention you are attending the SLS conference in Boston Massachusetts. For those attending the conference who require special assistance (accessibility, dietary, etc. ), please contact SLS no later than August 17, 2016, with special requests. Boston is one of America’s oldest cities and is home to some of the world’s finest in-patient hospitals, many institutions of higher education, and numerous cultural and professional sports organizations. Tourism is one of Boston’s and New England’s largest industries, and as a result you will find that Boston is a city willing to accommodate and entertain you as few other cities can. Full registration fees are refundable if registrant cancels by August 3, 2016. An administrative fee of $150.00 will be deducted from fees for cancellations postmarked on or after August 4, 2016 through August 17, 2016. Refund requests will not be considered after this date, including visa denial refunds. All requests for refunds must be made in writing and received by SLS, attention Lauren Frede, by the appropriate dates. Refunds will be processed within 6 to 8 weeks after the conference. No refunds will be made after August 17, 2016. The conference is designed to meet the needs of the clinical or academic surgeon, resident, nurse, or technical support staff within all specialties who wish to increase his or her knowledge of laparoscopic, endoscopic and minimally invasive surgical and diagnostic techniques. Your participation in the Master Class of your choice and the many sessions will provide valuable information through dialogue, discussions and visuals designed specifically for you. This four-day conference will greatly expand your understanding of the development and use of new minimally invasive technologies and techniques. Sessions will concentrate on a variety of procedures, techniques, and issues important to laparoscopic, endoscopic and minimally invasive surgeons. During in-depth Master Classes, the faculty, experts in Gynecology, General Surgery, Urology, and other specialties, will share their experience, explain new and varied technology and techniques, and will lead discussions about issues and topics important to all specialties. The video session Surgical Surprises will bring panels of Master Surgeons together to show you the finer points of their techniques and to discuss how to handle surgical accidents, mishaps, and surprises with attention given to lessons learned and appropriate action/reaction. Updates on various specialties will be presented by SLS Special Interest Group (SIG) Committee members. Exhibits will feature the latest in products and services designed by leading manufacturers. All participants and guests are welcome. Tickets to attend are $175/person and must be purchased in advance. Includes Transporataion To/From Event, Tour of the JFK Library, Buffet Dinner, 2 Drink Tickets, and Entertainment by the Sticks & Stones Band. The John F. Kennedy Presidential Library and Museum is dedicated to the memory of our nation’s thirty-fifth president and to all those who through the art of politics seek a new and better world. Located on a ten-acre park, overlooking the sea that he loved and the city that launched him to greatness, the Library stands as a vibrant tribute to the life and times of John F. Kennedy. Our evening event starts with a tour JFK Museum which portrays the life, leadership, and legacy of President Kennedy, conveys his enthusiasm for politics and public service, and illustrates the nature of the office of the President. Enjoy Permanent Exhibits of the Leadership for the 60’s Campaign Button Campaign Trail, The Briefing Room – John F. Kennedy was the first president to effectively use the new medium of television to speak directly to the American people through live televised press conferences. Video samples of his responses to reporters’ questions and exhibits of objects and documents illustrate the wide range of issues he confronted as President. In 1961 responding to the Soviet Union’s lead in the exploration of space, President Kennedy challenged the United States to keep up in the “Space Race” and not fall behind the Soviets, Watercolor Painting of the White House, the Treaty Room, as well as exhibit highlights of Lady Jacqueline Bouvier Kennedy and her achievements as First Lady. Enjoy some wine in the JFK Museum Atrium overlooking spectacular view Boston Bay and then on to a wonderful buffet dinner and music by our very own Sticks & Stones Band in Smith Hall. Minimally Invasive Surgery Week/SLS Annual Meeting employs a variety of educational formats including topical general sessions, the presentation of scientific papers, open forums, posters, and original videos offered in small specialty-specific breakout sessions, and informal gatherings of participants and expert faculty. The increasing complexity of minimally invasive diagnostics and therapy requires a continuous educational process. The exchange of knowledge and expertise among the physicians taking part in this conference contributes to the continuation of excellence in minimally invasive surgery. Acquire educational information within the physician’s specialty, which will enhance their professional development and patient care. The Society of Laparoendoscopic Surgeons (SLS) is accredited by the Accreditation Council for Continuing Medical Education to provide continuing medical education for physicians. The SLS designates this live activity for a maximum of 24.50 AMA PRA Category 1 Credits™. Physicians should claim only the credit commensurate with the extent of their participation in the activity. In order to provide a high level of continuing medical education for its members, The Society of Laparoendoscopic Surgeons (SLS) follows the Essential Areas and Criteria of the Accreditation Council for Continuing Medical Education in planning and developing CME activities. To help as a planning guide SLS has a CME mission statement, which includes the CME purpose, content areas, target audience, and type of activities provided. SLS also identifies the expected results of its CME activity. SLS identifies the educational needs and desired results for all CME activities. SLS has an organizational structure that supports our CME activities. In order to achieve a level of CME excellence for our members, SLS has developed a “Template of Excellence.” This document lists various examples of innovative ideas that SLS utilizes to exceed the basic level of compliance required by the ACCME. SLS looks forward to receiving input from you in order to continue to improve these processes and provide you with a meaningful continuing medical education in minimally invasive surgery.